Fill out an Online Adoption Application below. Your application will be reviewed and sent to a volunteer in your area. The volunteer will contact you to schedule a home visit within one week. There is a $25.00 fee for a volunteer to come to your house for a home visit. This fee is non-refundable, but will be applied to the adoption fee when the adoption is finalized. After your home visit is complete and you are approved you can begin meeting dogs. The Adoption Coordinator will assist you in this process. Please note: The application process begins immediately once an application is submitted and approvals tend to occur quickly. Please do not submit an application unless you are ready to take home a dog. ABR does not have the space or capability to hold dogs, therefore, dogs are adopted out on a first-come-first-serve basis. If you are not able to proceed with a home visit when contacted by an ABR volunteer then your application will be filed away. We will ask you to resubmit your application if you wish to adopt later date. Email questions about the adoption process to [email protected] for Austin and All Other Areas or [email protected] for San Antonio Areas. 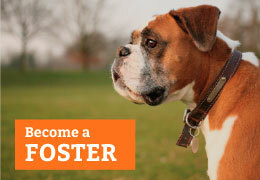 NOTE: Vet records for adopted dogs will be mailed out in approximately 2 weeks from the date of confirmed adoption. The mailed records will also include tags (rabies and microchip). We do not release the records until we know that dog has been permanently placed. Please keep in mind that we are a volunteer organization and we work as promptly as we can. If there is a truly a medical emergency than we can try to expedite the process but your vet should not refuse to see your new dog without records. If you are refused than we suggest visiting one of our recommended vets. Please list at least one other Adult living in the home as your Co-Applicant. If you are the only Adult, please leave blank. My dog travels with me. If so, please explain why. If yes, what kind of Heartworm preventative does your dog take? It is extremely important that we have your Vet Information and approval to verify. We do contact your Vet to verify information before approving applications. We realize that you may not have this information if you currently do not have a pet. Adopter agrees to keep the dog identified above and assume all expenses and liabilities incurred. 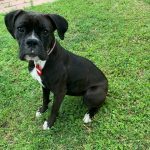 Adopter agrees to provide responsible humane care of the above mentioned dog proper veterinary care, yearly vaccinations and monthly heartworm preventative are a must. Proper precautions should be taken against theft, running away, the dogs well-being should always be a prime concern. ABR retains the right to reclaim said dog (at no cost or obligation to ABR) at any time it is deemed by ABR that the adopter is remiss in caring for the dog. This shall include but not limited to: being left in an unsanitary environment, mental or physical cruelty, leaving the dog in a car during warm weather, tying up outside while gone, riding in the back of a pickup truck, walking the dog without a leash, failure to provide proper nutrition, housing, training and/or veterinary treatment. 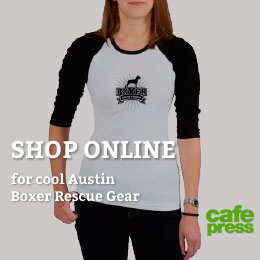 Adopter will be responsible for all reasonable and necessary attorney or legal fees as a result of Austin Boxer Rescue enforcing the contract. Financial and physical: I hereby testify that I am financially and physically able to care for a dog, understand that proper food, veterinary care and other necessities can be costly and that I can meet these requirements. I further testify that I am physically fit to provide all necessary activity for the dog. If for any reason you are unable to keep said dog it is to be returned to ABR with a minimum of 21 days’ notice. 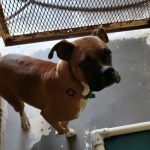 72 Hour Trial: You will have 72 hours from the time you have selected your rescue boxer to decide if this is the right dog for you. The adoption fee will only be refunded if the dog is returned within the first 72 hours. Transportation back to ABR is the sole responsibility of the adopter (even during the first 72 hours). If the dog must come into rescue sooner and a foster home cannot be found the Adopter is responsible for all boarding and veterinary fees incurred in boarding. Under NO circumstances shall the Adopter place said dog with any person, rescue group, foster home, agency, or Humane Society. If after the 21 days ABR cannot take back the dog, for whatever reason, adopter may place the dog after giving ABR an addition 7 days’ notice of intent to do so, further, adopter must provide ABR with information on potential placement and potential placement must go through ABR screening process. If no notification is given to ABR and it is found out that the dog has changed ownership, under the conditions of this contract the Adopter must pay ABR $500.00. 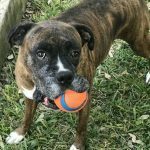 Microchip: Adopter must understand that the contact information for the dog's microchip will remain in the name of Austin Boxer Rescue for the safety of the dog. 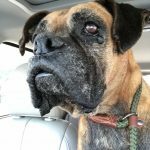 It will be the adopters responsibly to notify ABR if the dog is missing. ABR will make every effort to contact adopter from the information we have on file, so that the dog and adopter can be reunited. If ABR is unable to reach owner after two weeks, the dog will be placed back up for adoption. Truthfulness: I understand that if the information contained herein is found to be false, my application will be refused or said adopted dog shall be relinquished to ABR without a refund of the adoption fee. Adoption fee statement: I agree that the adoption donation is NON-REFUNDABLE even if the animal is returned to ABR. Heartworm Treatment: If the dog I am adopting is heartworm positive, I understand the dog will be treated by ABR with immidicide by ABR’s veterinarian and at ABR’s expense as immidicide is available. The cost of PREVENTION with a monthly heartworm MEDICATION is the responsibility of the adopter. Adopter accepts the boxer “as is.” Because of this, the adopter understands that ABR relinquishes responsibility if the boxer should become ill or die after being released to adopter or should bite, scratch, injure or cause the death of any person or animal or cause damage to property after being released into the adoptive home. The Adopter hereby accepts possession of, title to (subject to the conditions of the adoption contract), and responsibility for the animal adopted. Further the adopter agrees to release and hold harmless ABR forever from liability for any injury or damages to any person or property caused by the adopted animal, and from any causes of action, claims, suits, or demands whatsoever that may arise as a result of such injury or damages. Please click the Submit button only once. Application may take up to one minute to complete and possibly longer based upon your internet connection. You will be sent to a confirmation page once your application has been submitted and should also receive a confirmation email.